Rick Schultz never knows when the ground underneath him might disappear. While driving his tractor in a southeast Kansas farm field, Schultz watches for sinkholes. Sometimes the sinkholes happen overnight and sometimes after one lap around the 42-acre field. The remains of a long-abandoned coal mine are below the surface of the Cherokee County field Schultz farms for the landowner. The mine’s ceilings have been collapsing for years. The front end of a tractor his late father, Robert Schultz, was driving once dropped into a sinkhole. Luckily the big tires on the back of the tractor were wider than the hole, and the disc it was pulling helped stabilize the machine. “It bruised him up pretty good,” Rick Schultz said. 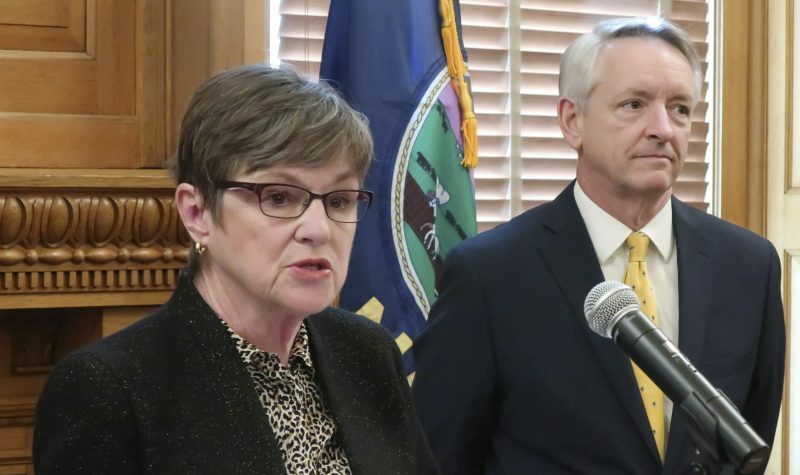 The sinkholes are just one of the lingering legacies of coal, lead and zinc mining in southeast Kansas, industries that once rivaled agriculture in that area of the state. But mining also left the land scarred, contaminated with pollutants. The troubles persist. ¢ Fearing that an entire community may be swallowed by the earth, Oklahoma is using federal assistance to evacuate residents of an old mining town. 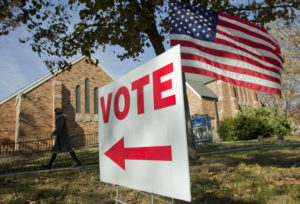 Just across the border, a Kansas community facing the same fate waits on federal bureaucracy for help from the state’s congressional delegation. ¢ Wastes from mines have contaminated groundwater requiring new, deeper community wells to be dug. ¢ Some children suffer from lead poisoning because they play in contaminated soil in their yards or because they’ve played in the piles of tailings. ¢ Mining companies that still exist have paid for only about $1 of every $9 spent on remediation. ¢ The mining environment can be cleaned up and much of it has been – at a cost of up to $90 million – but more work remains. It could take 20 years and up to $70 million more. Coal began to form in Kansas 300 million years ago when swamps and marshes covered low-lying areas. Plants died and were covered by water, mud and sand, according to the Kansas Geological Survey at Kansas University. Layers of sediment covered the decaying plant material, compacting it over millions of years and producing coal. In the extreme southeastern corner of Cherokee County, lead and zinc ore dominated the underground geology. Lead is a corrosion-resistant metal with many industrial uses. It is used in ammunition. Zinc also is anti-corrosive and is used in construction material. Most Kansas coal mining took place in the southeast counties of Cherokee, Crawford and Bourbon, where hundreds of underground shafts and above-ground strip mines were dug. Around those mines, communities and camps were built for workers and their families. At the turn of the 20th century, Cherokee County’s population was at least double what it is now. Galena, Baxter Springs and Treece in southeastern Cherokee County were found to be rich in lead and zinc. The area became part of the Tri-State Lead and Zinc Mining District, which includes parts of southwest Missouri and northeast Oklahoma. During the first half of the 20th century the Tri-State District was the world’s leader in zinc production. 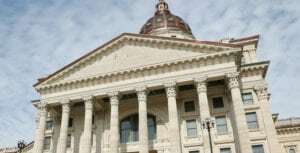 It was almost like the California Gold Rush, said Rex Buchanan, associate director of Kansas Geological Survey. A coal miner picks at a bed of coal in this photograph from 1950. 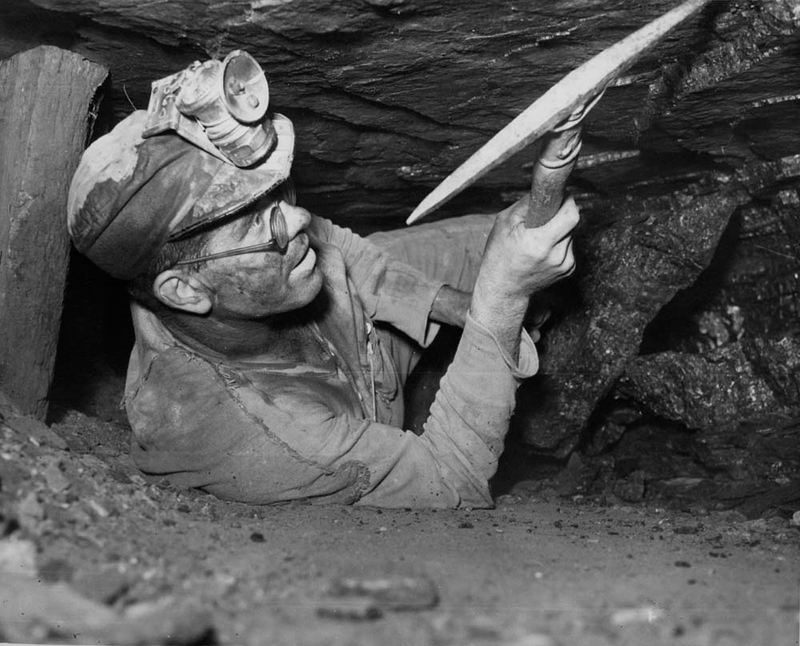 Chronic lung diseases, such as pneumoconiosis, commonly refered to as black lung, were once common in miners, leading to reduced life expectancy. Darrell Shoemaker, a Galena city councilman, had three brothers who worked in the mines, as did his father. A town named after the primary ore mineral of lead, Galena’s population was 3,287 in the 2000 census count. 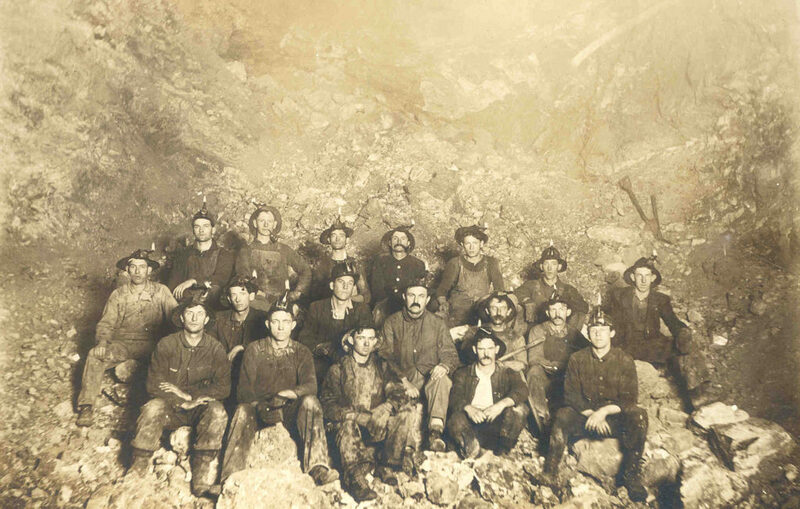 In the 1880s and 1890s, people from the East Coast and European immigrants traveled to southeast Kansas to work in the coal mines, said coal mine historian William Powell, a retired Pittsburg State University professor. Merchants in Pittsburg advertised in foreign languages to attract immigrant workers. “They had no education and the best work they could get was doing manual labor such as working in the mines and metal smelters,” Powell said. The work didn’t always pay very well, and it was dangerous. Injuries and deaths occurred underground because of explosions and cave-ins. Mining companies set up camps for workers near the mines. They built houses, sometimes little more than shacks, for their families. Murray Balk, left, and Randy Johnson measure a 30-feet wide sinkhole caused by undermining in Rick Schultz's field in Southeast Kansas. Abandoned sub-surface coal mines are collapsing, causing sinkholes and large ground collapses that often times lead to voids hundreds of feet deep throughout the tri-state mining district in southeast Kansas. In the coal mining areas there were camps and villages with the names such as 42 Camp, Ringo, Foxtown, Capaldo, East and West Mineral, Weir and Little Italy. Lead and zinc mines near Treece along the Oklahoma border were called Turkey Fat, Tiger, Rebecca and Silver Fox. Census records show Cherokee County’s population was more than 42,600 in 1900. Crawford County’s population was nearly 40,000. In the 1920s and 1930s the counties’ populations were still above 30,000. Population then steadily declined in Cherokee County, to 21,555 in the 2005 census. Crawford County’s population was 38,200 in 2005. By the time the last lead and zinc mines closed in Cherokee County in 1970 nearly 2.9 million tons of zinc and 700,000 tons of lead had been produced, according to KGS. The first underground coal mine shaft in southeast Kansas was constructed near the present-day town of Scammon in 1874, Powell said. Although there had been other forms of mining prior to that, shaft mining became the dominant method. When the minerals were exhausted by the mid 1970s, the mines were shut. The last coal mines were closed in the 1980s. During 150 years of coal mining, Kansas had produced 300 million tons of coal. 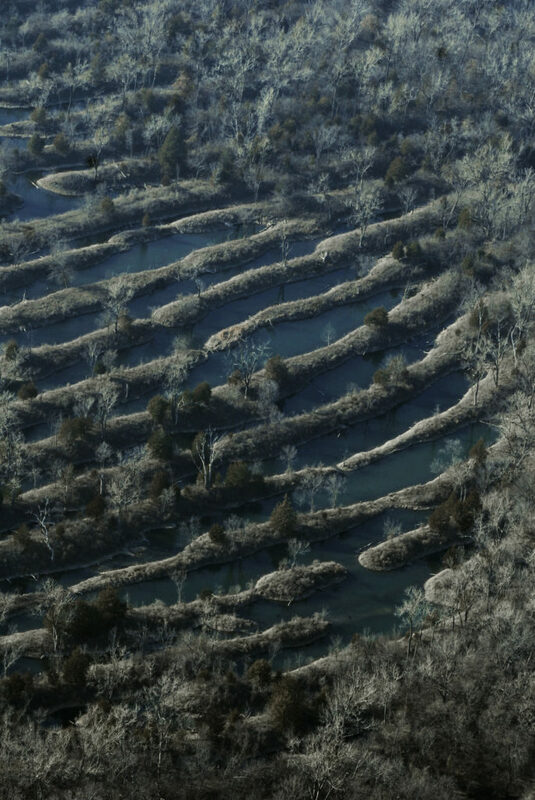 Surface mining left large devastated areas of land, called spoil banks, as seen from 2,000-feet above Weir, Ks. The Surface Mining Control and Reclamation Act, passed by Congress in 1977, established a program for regulating the surface mining industry and reclamation activities. The law sought to minimize the adverse social, economic and environmental effects of surface mining. 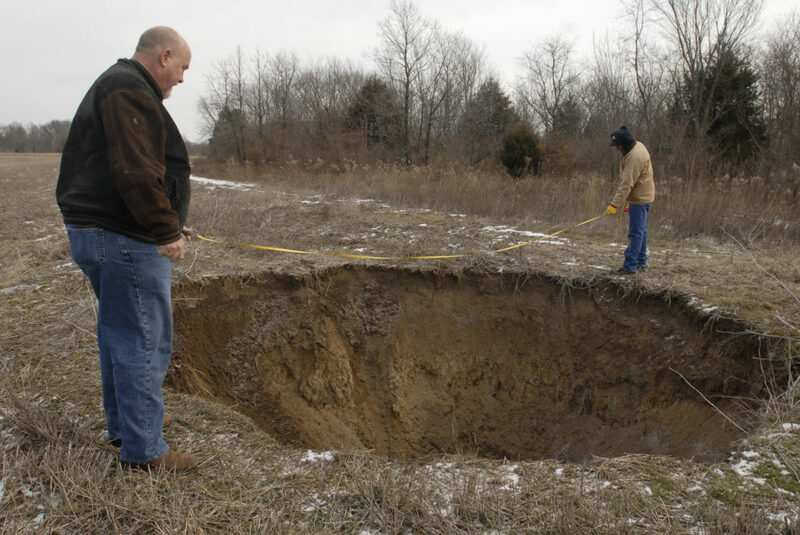 On a day in February, seven sinkholes of varying depths and sizes could be found scattered across the field Schultz farms north of Columbus. The largest was 12 feet deep and 20 feet across. 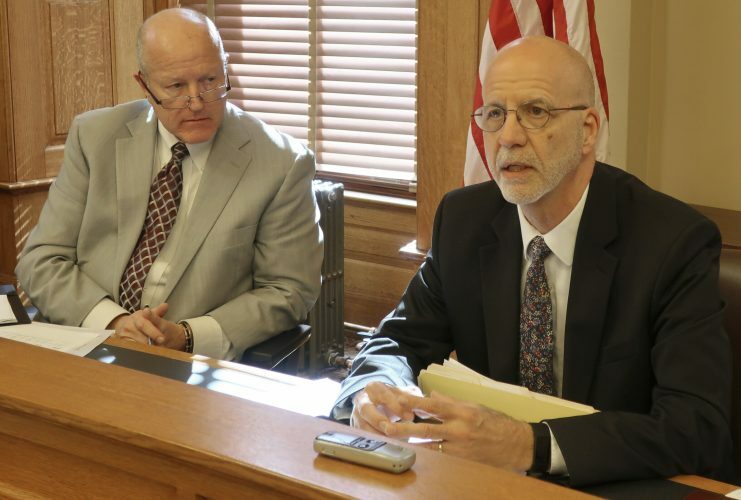 At the bottom was a small crevice, which probably opened into a mine room or passageway, said Murray Balk, section chief of the Kansas Department of Health and Environment’s Surface Mining Section office in Frontenac. 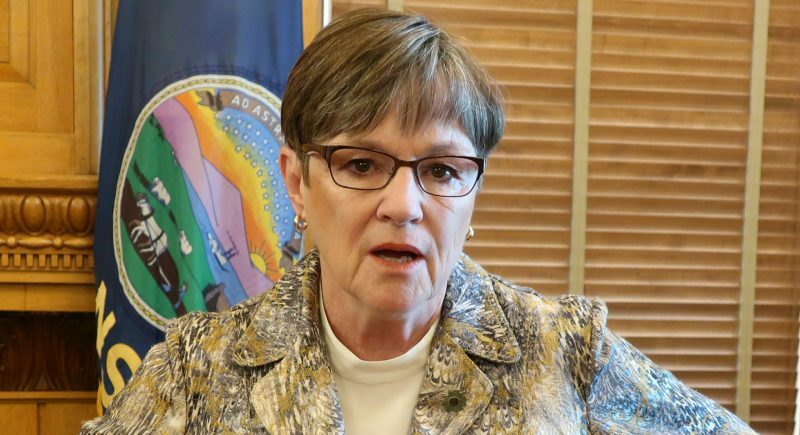 “The roof of the mine collapses and the geology above it is not consolidated enough to hold the ground surface up,” Balk said. Balk’s office oversees the state’s Abandoned Mine Land Program, which abates mining-related hazards. 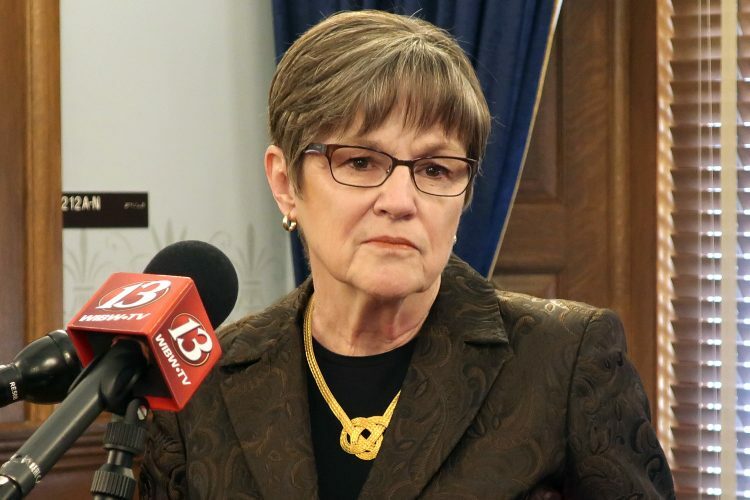 The state hires a private contractor to fill and cover subsidences, sinkholes and open mine shafts. Since 1996 when a concerted effort began to fill coal mine collapses, nearly 700 openings have been closed. In 2004 the state also began closing abandoned lead and zinc mine openings. Nearly 60 of them have been closed. There are still many more mine openings and subsidences to deal with, especially around the towns of Galena and Treece where there were numerous lead and zinc mines. Exactly how many collapses there are isn’t clear, because more of them appear as time goes on.